By Blakey's. Small card boxes approximately 4.5 x 4.5 x 1.5cm. 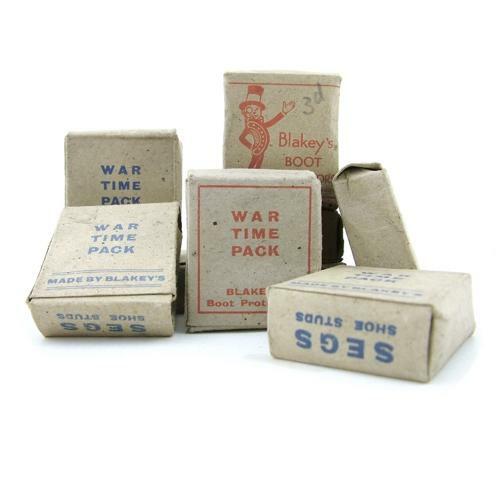 Clearly marked 'WAR TIME PACK'. Complete with contents of metal 'Segs' used to protect and prolong the soles/heels of footwear. Boxes are dusty and a bit squashed. Segs have minor corrosion in places. The 'blue' packs are suitable for shoes whilst 'red' packs are intended for boots and have Segs in various sizes. These are sometimes found used on RAF shoes and boots but were of course widely used by everyone in the days of 'make-do-and-mend'. Packs are priced individually - choose from 'boot' or 'shoe' type. Stock code BOSEG1.